Find more information about the unicorn of the ocean in Narwhal facts. Narwhal is known with the scientific name of Monodon Monoceros. It is considered as the rarest whale in the world. Many people call the animals as a mysterious creature of the ocean. Narwhal has a large horn like tusk which make the whale unique and special. Here are the facts about narwhal. The population of Narwhal around the world is only 45,000 to 50,000 individuals. The animals are very rare so that the population is small. Narwhal likes to eat fish, squid and shrimps. Find another animal with similar diet in humpback whale facts. If you want to meet narwhal, you can go to the Russian water of Arctic or Atlantic Ocean. The animals have the habit to travel on eastern Russia and Greenland. Most scientists agree that narwhals are a slow animal. But they can swim in high speed if they feel threatened by the predators. The animals can dive in the depth of 5000 feet. 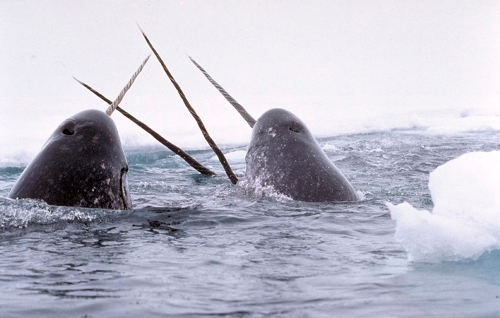 During the winter months narwhals like to live under the packed of ice. When the summer season comes, they will move to the shore. A group of narwhals is called as a pod. Narwhals are a social animal. They like to travel in a pod. A pod will consist of 10 till 100 individuals. Read whale shark facts to find another group of animal. 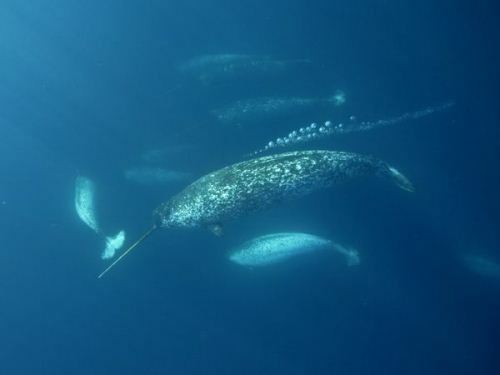 When Narwhals communicate with other members in in a pod, they will use various types of sounds. It can be in a clicking, trilling or even squalling sound. As I have stated before the male narwhal has a tusk. A behavior called tusking is conducted by crossing the tusk to other members in a pod. It is a sign of cleaning the tooth, friendly contact or dueling. The mating season begins from March to May. The gestation period is 16 months. The female Narwhal will deliver 1 calf per litter. When the calf was born, it has brown color with no spot. The female will give birth to a calf every three years. The main hunters of narwhal are orcas and polar bear. Human being also likes to hunt it. The native Inuit people are legally hunt the animals on the ocean. 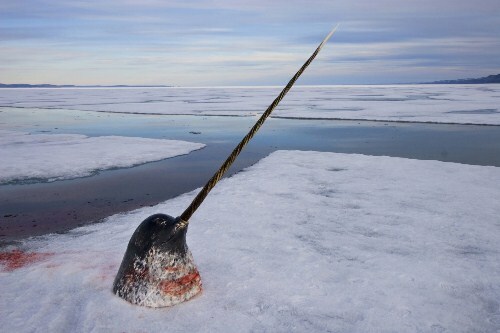 The population of narwhal is decreased not only because of the predators but also climate change and pollution. They are so vulnerable because the food is getting limited. The tusk that narwhal has is counted around 7 to 10 feet. This tusk is also important to show their rivals the aggressively and dominance. The weight for the animal can reach 3,500 lbs. with the length around 13 to 20 feet. 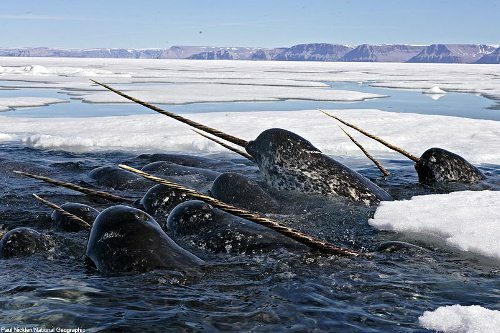 When they are in the water, narwhal will use their forehead. They can feel the wave sound. What do you think on facts about narwhal?